In the event that HomepointXI updates the server and you need to update your client, you can follow these simple steps to keep your client updated. Please note: It is important that you DO NOT update your client while playing on HomepointXI unless you are told to! Being on a different client version may cause you have issues with some quests/missions. It may also block you from connecting to the server until it is updated and you are able to connect again. News posts will be made anytime we request players to update their clients. Before beginning to update, please make sure you have done all the following to ensure your update is done properly and is done when required. 1. Be sure that you have fully installed the game already before attempting these steps. 2. Before updating make sure that you need to update. Check the front page (http://homepointxi.com/) on the top-right for the current client version on the server. Compare this to your current client version by going in game and using /ver command. If you cannot get into the game, you can find your version other ways, see the Q/A below for more info. 3. Be sure to log fully out of all instances of the game. You should not be logged in at all. This step is required to update your client without logging into retail and getting the update normally. This forces PlayOnline to update your game without having an actual game. If you do not delete the dat file, you will not be able to get the latest updates from the retail server. Open your Final Fantasy XI folder. Once you are in this folder, open the ROM folder. Then open the 0 folder. You should see a list of files numbered 0 to 100+ in this folder. Delete the file named 0.DAT, it should be the first file listed. Last, you need to check files just like we did in the post above. Open PlayOnline. Choose 'Check Files' from the left side of the screen. 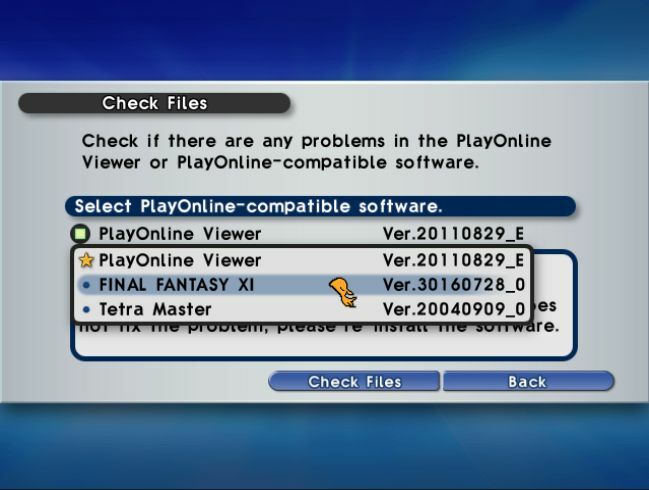 Select Final Fantasy XI from the drop down list, then choose 'Check Files'. Allow PlayOnline to check your installation, it should end up with at least 1 error. Choose to repair the error(s). At this point, PlayOnline will now download the full latest updates from retail. If you followed directions, once this is done, you should be fully up to date again. This page was last edited on 15 August 2018, at 00:39.